Annie Jennie (Shaw) Youngblood was born to the late Neal Shaw and the late Maggie Clark, in Shorterville, Alabama on April 5th, 1924. She was the fifth child of this union with 2 boys being born after her. Her siblings which have all passed were: Mary Lee (Sis) Shaw, Fannie Kate Shaw, Twins (Isaiah and Ezekiel) who died during childbirth, Tom Lee (Bud) Shaw and Joe Lee (Sonny) Shaw. She had 2 other siblings from her father Neal’s previous marriage, Beatrice (Bee) Shaw and Branford (Buster) Shaw. She was the last of her generation and went to join her family in eternal rest, after her passing on Friday, August 31st at 8pm at the Enterprise Rehab facility. Annie Jennie, as she was known, was educated in Clay County, Georgia and graduated from Speight High in Fort Gaines, Georgia. After graduating from Speight High and realizing her body was not built for picking cotton, her family supported her so she could attend Alabama A&M and become a school teacher. During her time at Alabama A&M she formed many friendships but the one friendship that she made that lasted a lifetime was when she met, Lamar M. Youngblood. They quickly became attached and got married on November 14th, 1952 in Clay County, Georgia and moved to Sconiersville, Alabama, where they served their community faithfully. Who was Annie Jennie (or Auntie)? Annie Jennie was a dedicated, loyal, caring, faithful and loving mother to her family and her community. These traits were instilled in her by her mother, Maggie, and were a part of her daily life. She was a dedicated educator who served both in the Henry County School system and along with her husband, Lamar (who was principal), the Bellwood School System. Her dedication led to this husband and wife, taking out personal loans to support the Bellwood School system, when financial difficulties arose. She was a faithful and loyal servant to her community organizations (Eastern Star Oliver Twig, Heroines’ of Jericho, Ladies Aid, and the Southeastern Alabama Women Missionary Societies) for over 50 years. (Of note she was a Life Member of the Women’s Missionary Society after serving 25 meritorious years. Annie Jennie (or Auntie) was a faithful, obedient, and dedicated servant of the Collins Chapel AME church after relocating from Henry County where she was a member of the Old Friendship AME church. As a member of Collins Chapel AME church she set a standard that no one can question. She was the Superintendent of the church school for over 50 years, dedicated steward, trustee, and unwavering church member who up until her illness would drive herself, 25 miles from Sconiersville to New Brockton, and was always the first to arrive. However, her most proud title was that of being a daughter, a sister, a wife, a cousin, a neighbor, a servant and an aunt to so many individuals. Annie Jennie or Auntie LOVED HER FAMILY, HER GOD and HER COMMUNITY. 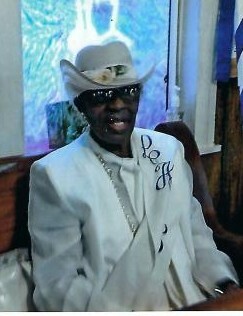 Leonard “Scooter” Gaines, a nephew whom she raised and have no doubt considered him her son, Renee (Tom) Jones, a niece who she loved dearly, Lawrence Peppers-Beyah, a nephew who she loved dearly. Willie Terry, a dedicated church member who she considered a son, and Dorothy (Dot) Sconiers Bevil, a niece who auntie was always with. And so many others nieces, nephews, cousins, community member and church members.